Welcome to the Aquastar Owner's Club website. This provides a place where Aquastar boat owners, present or past, can make contact and keep in touch. It will enable members to share experiences and challenges, discuss problems encountered, and hopefully receive suggestions or solutions. If you are going on a cruise, or even a short trip, and would appreciate the company of another boat on the journey, or even discover if one may already be at your destination and happy to meet up with you, the 'Member's trips' page is for you. In addition we plan to have one club meet each year followed by a cruise in company for those who wish to stay on. These are planned to alternate between the south coast of England and Guernsey, which is of course the home of Aquastars. Please see under 'Club events' for further details. In the 'members only' pages (Club events, Member's trips, Newsletters & articles, and Member's forum) you can also post any suggestions, requests for help or information, and even review old newsletters and technical articles. There is no annual subscription though if you wish to become a member there is a one-off joining fee - please see under 'Contact us' if you wish to join. Inaugural Commodore! – that is the grand title Geoff Willson the managing director and owner of Aquastar Ltd gave me when I suggested setting up an Aqua-Star Owners Club back in 1998. We started with an email and letter to the address database that Geoff had on file. Fairly quickly it became clear that there was a real enthusiasm to create a club. 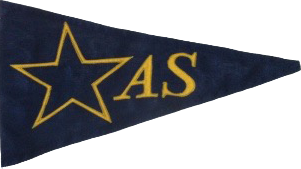 A competition was run to design the burgee and to name the proposed newsletter, originally called ‘Aqua-Data’. We also designed the Aqua-Star Club tie ! Geoff was incredibly supportive from the start, helping to fund the ties and burgees. We wanted to keep things simple – not committees, for example. 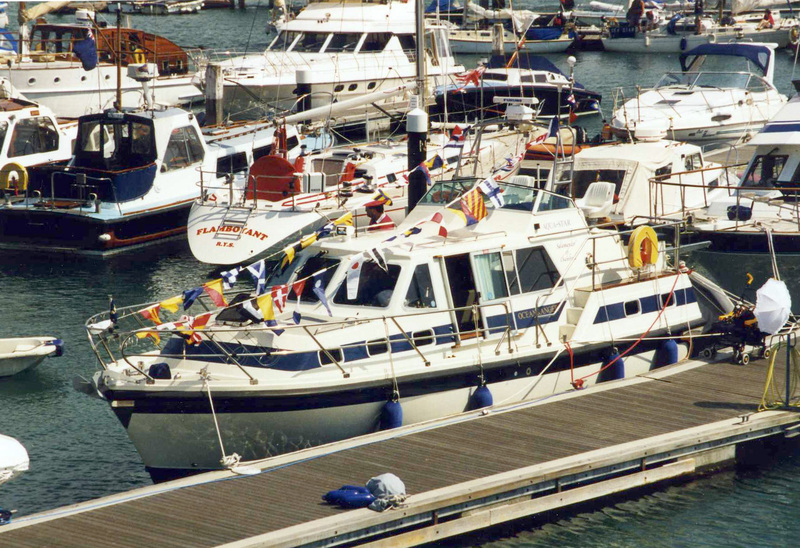 We also arranged to have a meal together after meeting at the Southampton Boat Show, which was well attended. Geoff and his wife Christina attended for the weekend, and I have the great memory of welcoming both plus a baby Willson on my boat for the first time, just a bit nervous about some of my woodwork – but it passed inspection by the boss! My sons Ollie and Nick were still small then but helped me to marshal the boats in as they arrived. The boat that won our ‘longest voyage prize’, a UK Courtesy Flag, was the crew of Delta Star, who travelled over night from Ostend ! We had some pleasant restaurant meals, Geoff gave a welcoming speech and awarded the prize for the longest voyage as will as receiving a prize of his own from me ! The great things about Aqua-Stars is that they are all different – so a great time was had jumping on and off each other’s boats to see how owners had found solutions to various problems. I used to say to Geoff – these are not just boats, you build owner’s dreams, and even though spinal surgery forced me to sell my Salamander, I have all the photos and some great memories from that time. The inaugural rally, held in Cowes, Friday 28th to Monday 31st May 1999. 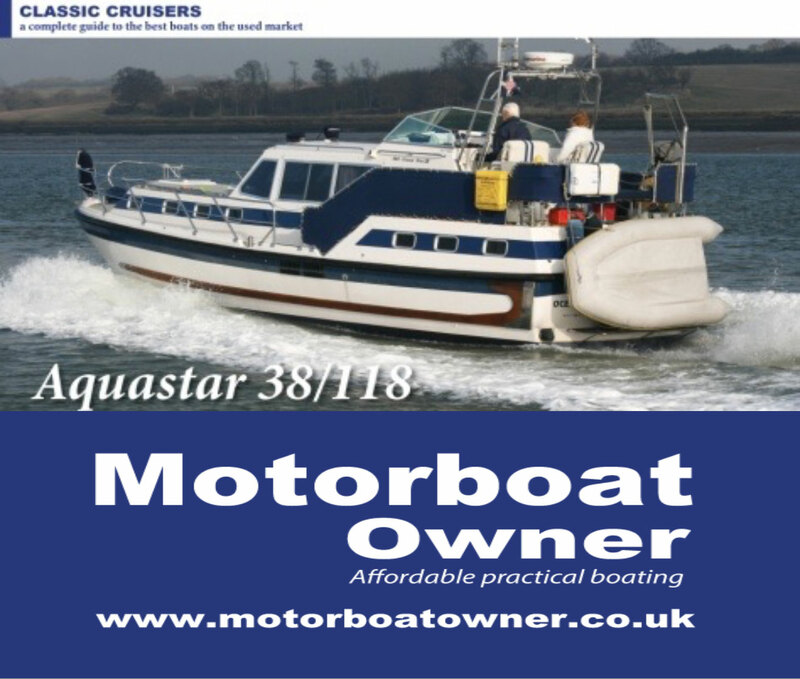 See this 'Classic Cruisers' review about an Aquastar 38 from the on-line free digital magazine 'Motorboat Owner' in their January 2016 issue.